Backtesting is a process of Testing the trading conditions with respect to the past historical data, evaluating not only the profitability of the system but the underlying risk factor associated with the Trading/Investing Model. Proper Backtesting gives belief and enough confidence to a trader to trade a set of rules. But are the newbie traders really doing proper backtesting? 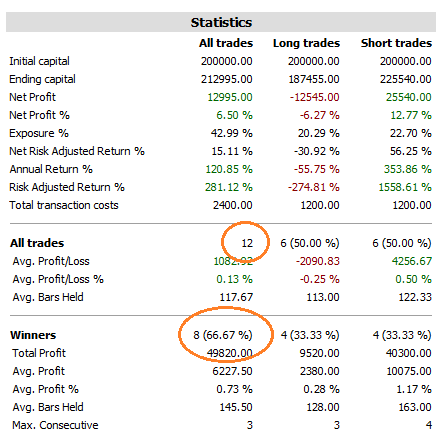 1)Backtest a trading system with limited dataset and if the system gives 60-80% winning ratio or 10% guaranteed returns every month then the newbie trader expect the same to extend in the future. In reality you cannot simply beat the market every month on month consistently and get guaranteed returns. Moreover the shorter time duration of backtesting (3-6 months) doesn’t cover most of the trading scenarios. Testing a strategy with small test data is dangerous and more possibe that it could provide misleading results. 2)Doing a backtest without position sizing : This is one among the mistake made by most of the fellow newbie traders. They dont give priority to position size and so by default most of the trading analysis softwares utilizes 100% of capital everytime and the 100% of returns are reinvested in each and every trade in default backtesting scenario without position sizing. Most of the times such kind of backtesting reports provides misleading, compounded and exotic results. In a real world scenario most of the traders dont want to reinvest their profits or they opt for fixed/variable quantity trading randomly (atleast a newbie traders) mostly non systematic and treating profits as their part of additional income. But the backtesting results are mostly systematic end results not suitable for discrete trading most of the time. i)Am I enough leveraged to trade such strategy? ii)Does this trading strategy suits my trading style? iii)Does this strategy can be traded by a Part time or seasonal/Lunch Time Trader? iv)What is the worst case scenario happened in the last 5-10 years of historical data? v)Which is the right timeframe to trade this strategy? vi)What is the worst case scenario involved in trading the strategy? vii)How many consecutive losses this strategy had made the past? What if the strategy is going to give 10-12 consecutive losses? viii)How much Iam willing to loose in a worst case scenario? ix)Does the strategy has enough risk-reward ratio? x)Can i handle a drawdown of more than 3 months mentally? xi)How much drawdown I can withstand trading a system before shutting them down? xii)Should I have to book partial profits? Should I have to fix a trailing stoploss/fixed stoploss? Which is the most efficient one? Backtesting gives the enough information about the risk involved in any sort of trading system. There is a saying that once the risk is controlled in your trading system the profitability is take care by itself by the trading system. 5)Not including Trading Cost : This is yet another mistake committed by fellow traders. If you are serious about trading your strategy then you should consider including your trading cost (Trading Software, datafeed, Internet Charges, Brokerage, Transaction Cost, Impact Cost, Slippages ,rollover cost..etc) to get more realistic results. These cost may seems negligible to you but in the long run its affects the overall performance of the trading system if not given enough consideration in your backtesting results. 6)Too much of Curve fitting : This is the mistake committed by newbie and fellow experienced traders. Once you know how to do optimization then next step people want to do is to find the best parameters which works in the past with great results. And keep on adding more optimization parameters to fine tune the system is yet again a dangerous game and often leads to curve fitting. It is often recommended to use not more than 2 optimization variables in any trading system. 7)Last but not least backtest a trading system and if the system gives descent results then the next step of a newbie trader is to trade live without validating the model. There are various ways to validate the model. One is doing a simple forward testing and checking how the trading system performs in the live market withtout trading the system and taking all the trading cost in consideration(the actual paper trading). The other methodologies to validate a model are performing walkforward testing & monte carlo simulation which we will discuss more in out upcoming articles. Excellent article! Not to mention, most newbie traders use repainting strategies to evaluate back-testing which will always show impressive results; however it can blow the trading capital if taken to live account..
Kindly help me and advice me that which particular strategy you feel is better of the A , B and C ? Observation with Strategy C: Performance of Profit Factor & Sharpe Ratio is quite good in FY 2013-14 and also in FY 2014-15 but the problem here is the number of Trades generated are very low. You cannot judge a trading system with just 2 years of data. It is recommended to test in high volatility zones like 2008, 2009 and in the low volatility zones like 2012 and 2013. More observation is required. I trade only with MCX Gold. Can you please suggest/advice me that from where can I purchase Historical IEOD of MCX Gold for the years before 01-April-2013 ??? Even I have a minimum collection. GDFL provides IEOD feeds. But the feeds are not continous contracts its non continuous contracts. Excellent article, truly a gem for any serious trader who has a goal to trade with system. A trader without system must not only read but re- read and then work on to design the system.. Looking forward for your next on monte carlo simulation . Which system you are back testing … can you. guide us.I will arrange data for you srom 2011.
its very true, read the article at least 5 times before investing. Important point is MDD which will clearly tell the capital required for your trading. Good article. Kindly keep on posting valuable articles regarding trading. i want to buy this software . software is available ? please guide me points wise for what type of trade strategy I follow according as per my below given point wise query. 1 – After generate 2nd candle is opposite to trade with same or big size of candle so can we taken trade or not taken or wait for next trade please specify in detail. 2 – If I want safety first with low risk of my investment in case of low profit so what type of trade you recommended from of commodity or stock or Nifty or bank nifty future or Nifty Option for long term continues trade till one year & it will be positional or intraday/ BTST/ STBT SM charts signal. 3 – What you recommended for trade daily in different commodity or stock or Nifty or bank nifty future or Nifty Option segments or done in any one segment & what is time frame & can I done continue trading in Nifty or bank nifty future or Nifty Option till one year. 4 – Any more accurate tips positional or one to two days long provide on profit sharing basis for of commodity or stock or Nifty or bank nifty future or Nifty Option & if provide so what is the ratio for profit sharing between you & me. 5 – 5 to 6 trade are in continue losses In many segments of commodity or stock or Nifty or bank nifty future or Nifty Option so can done 6th or 7th trade in case of book continues loss in last 5 trade have loss & if what is base of 85 % accuracy in case of continues loss in last 5 trade have loss. 6 – Continue update of stop loss is very difficult for working person for intraday trade for all week so ARE any POP UP OR SOUND ALERT provide at time of update or stop loss hit of trade like other chart service. 7 – Stop loss not hit of any of commodity or stock or Nifty or bank nifty future During Gap up or Gap Down opening & Loss book at open price so any advice from you for insure of hit stop loss. Awaiting for your detail reply on my all above query please for maintain long term relation please.